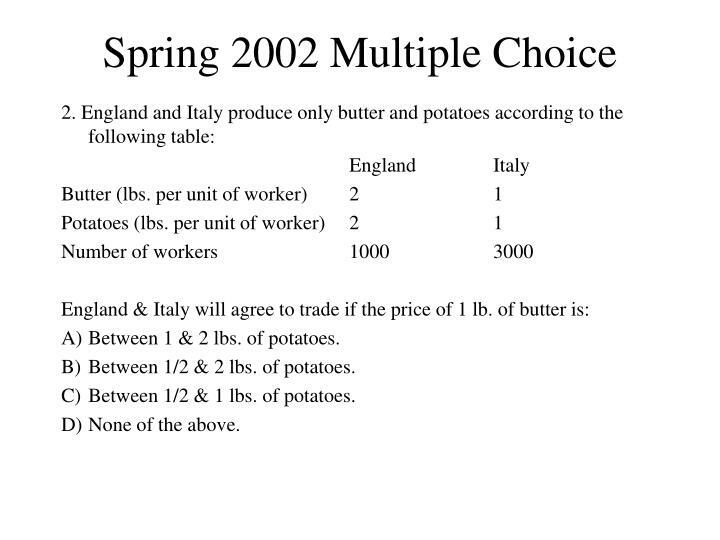 Spring 2002 Multiple Choice 1. 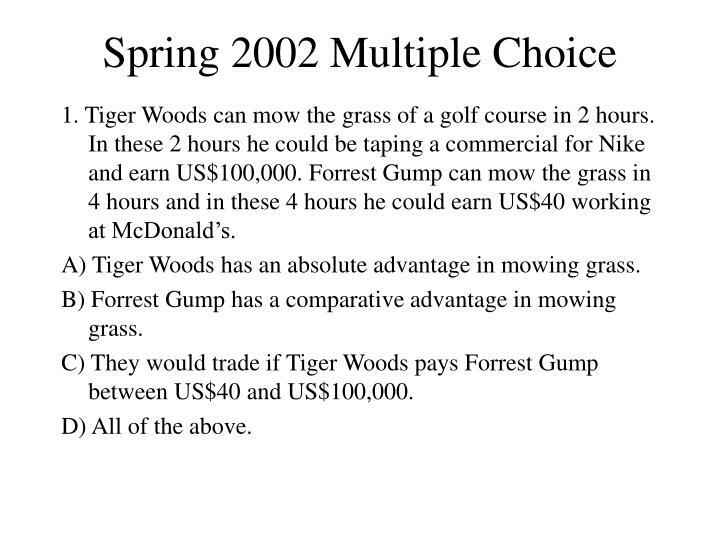 Tiger Woods can mow the grass of a golf course in 2 hours. In these 2 hours he could be taping a commercial for Nike and earn US$100,000. Forrest Gump can mow the grass in 4 hours and in these 4 hours he could earn US$40 working at McDonald’s. 1. 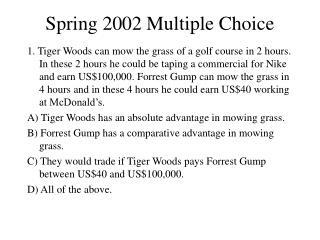 Tiger Woods can mow the grass of a golf course in 2 hours. In these 2 hours he could be taping a commercial for Nike and earn US$100,000. Forrest Gump can mow the grass in 4 hours and in these 4 hours he could earn US$40 working at McDonald’s. 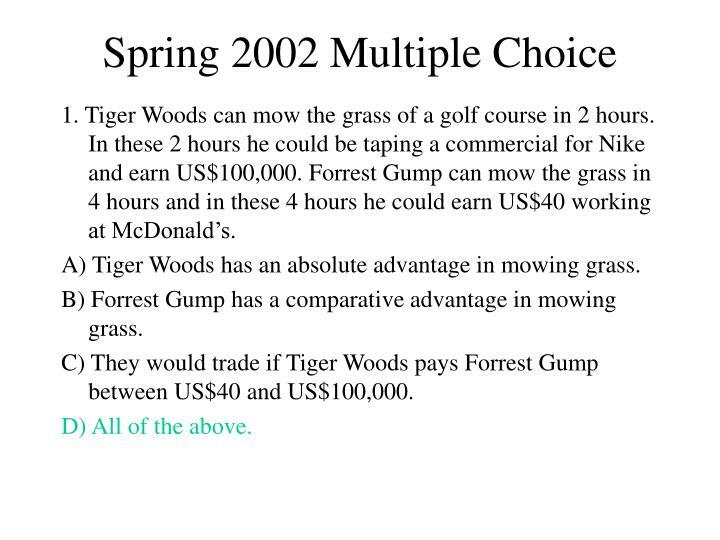 A) Tiger Woods has an absolute advantage in mowing grass. B) Forrest Gump has a comparative advantage in mowing grass. 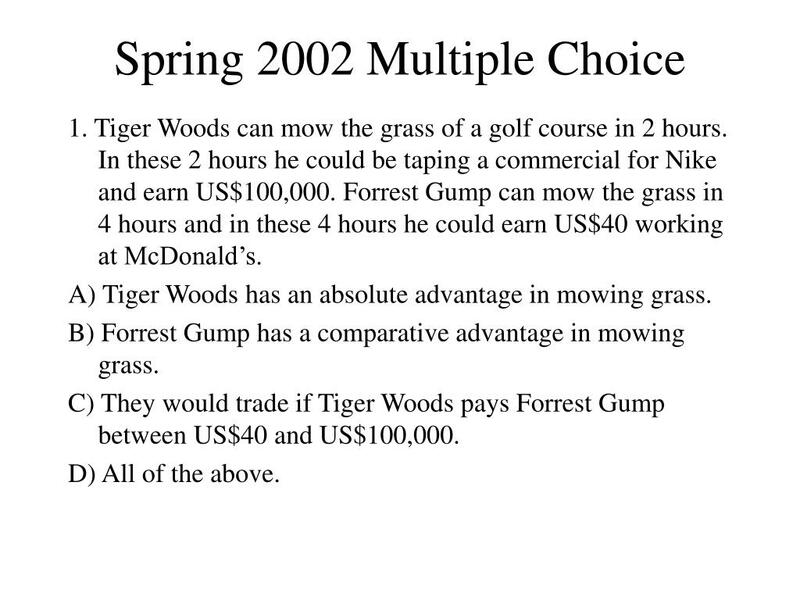 C) They would trade if Tiger Woods pays Forrest Gump between US$40 and US$100,000. d.	Italy has an absolute adv. 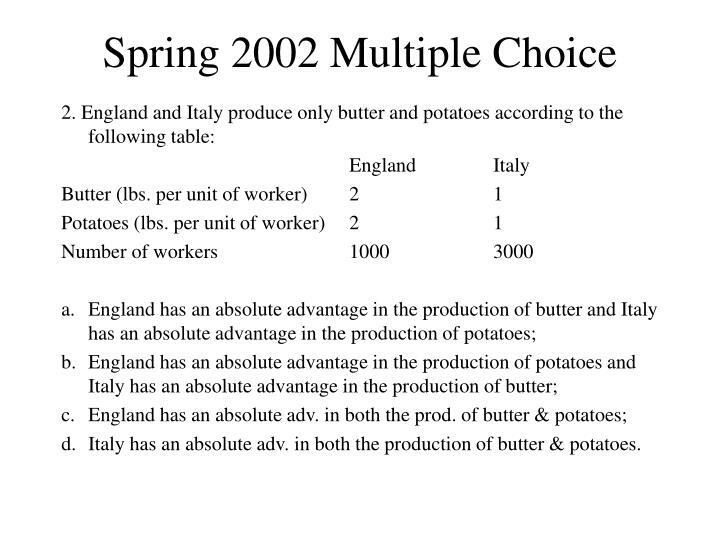 in both the production of butter & potatoes. 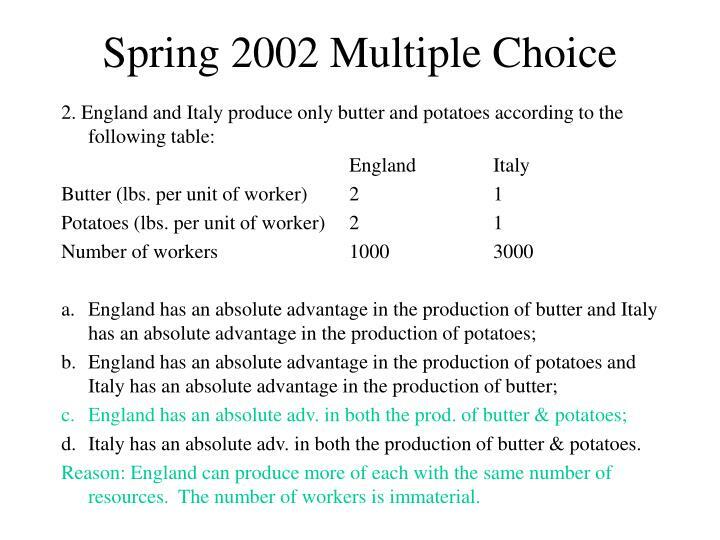 Reason: England can produce more of each with the same number of resources. The number of workers is immaterial. A) Between 1 & 2 lbs. of potatoes. B)	Between 1/2 & 2 lbs. of potatoes. C)	Between 1/2 & 1 lbs. of potatoes. 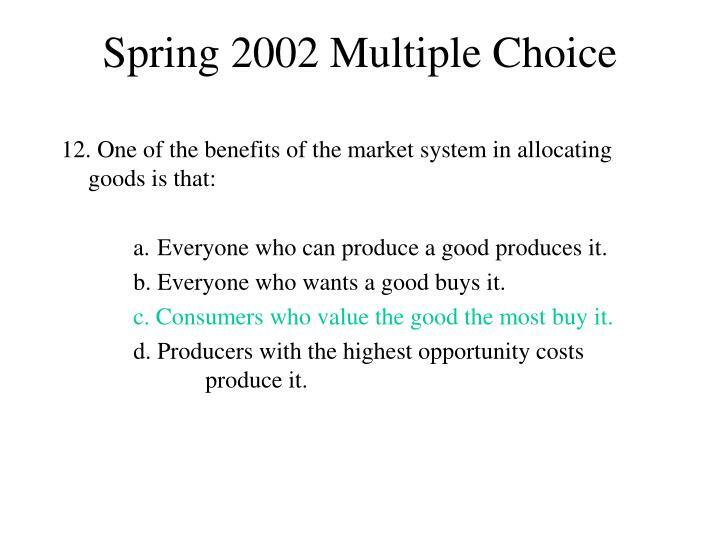 D)	None of the above; the opportunity cost of the two is the same. If each day skiing will cost Lynn $60 what will be her consumer surplus from skiing? 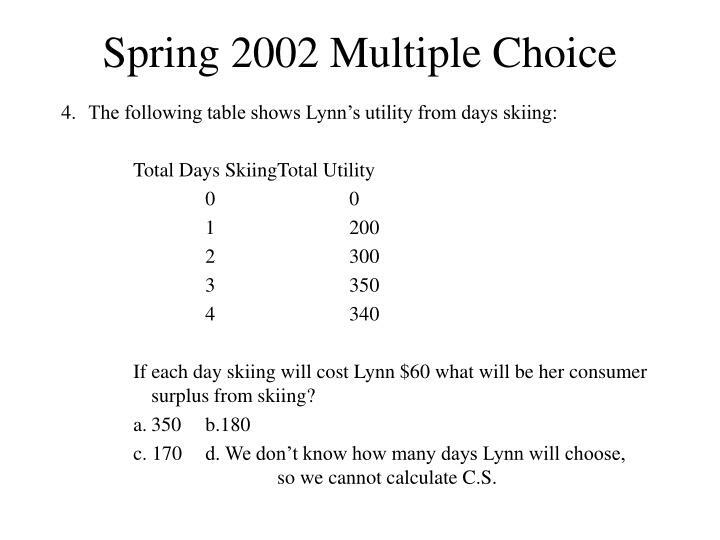 c. 170	d. We don’t know how many days Lynn will choose,	so we cannot calculate C.S. 5. 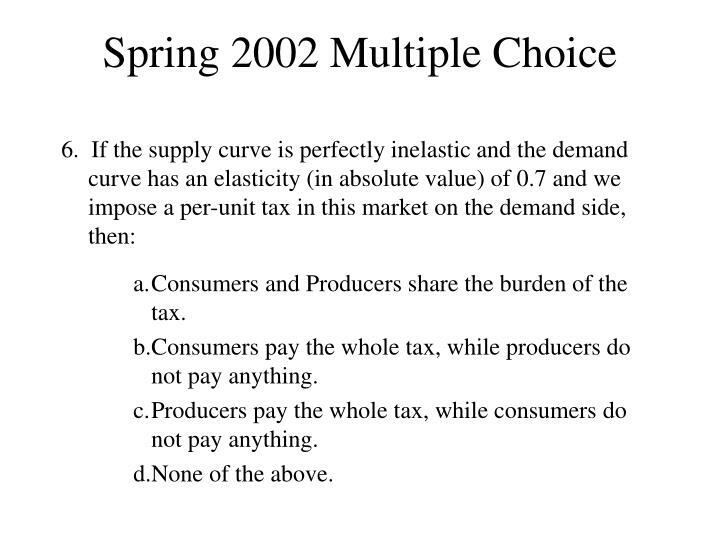 Which of the following could not shift out the market demand curve for a good? 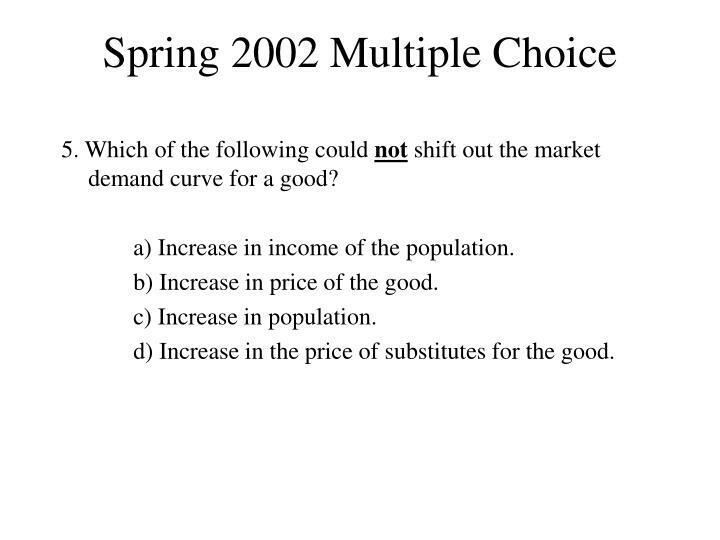 a) Increase in income of the population. b) Increase in price of the good. 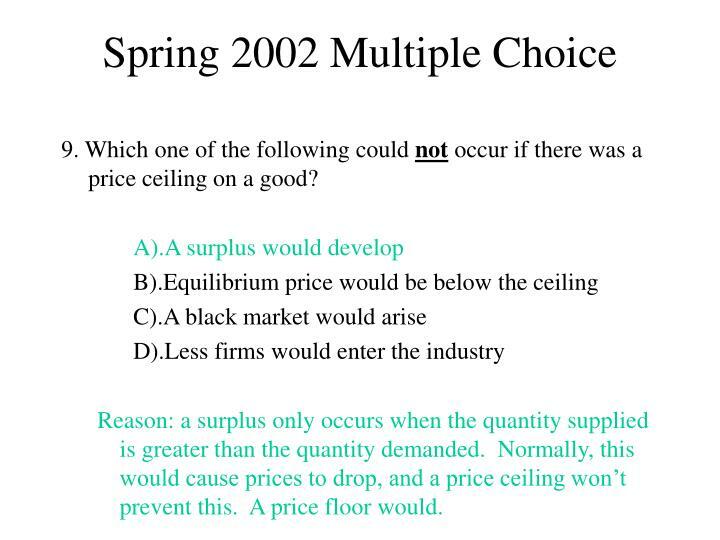 d) Increase in the price of substitutes for the good. 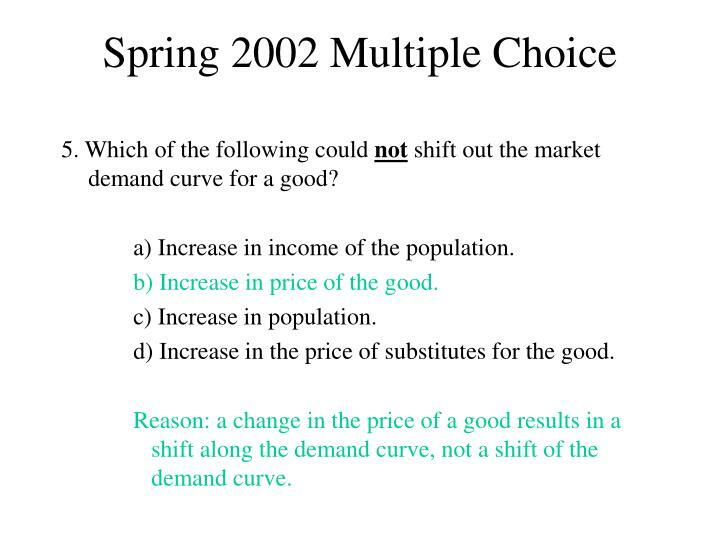 Reason: a change in the price of a good results in a shift along the demand curve, not a shift of the demand curve. a. Consumers and Producers share the burden of the tax. b.Consumers pay the whole tax, while producers do not pay anything. c.	Producers pay the whole tax, while consumers do not pay anything. 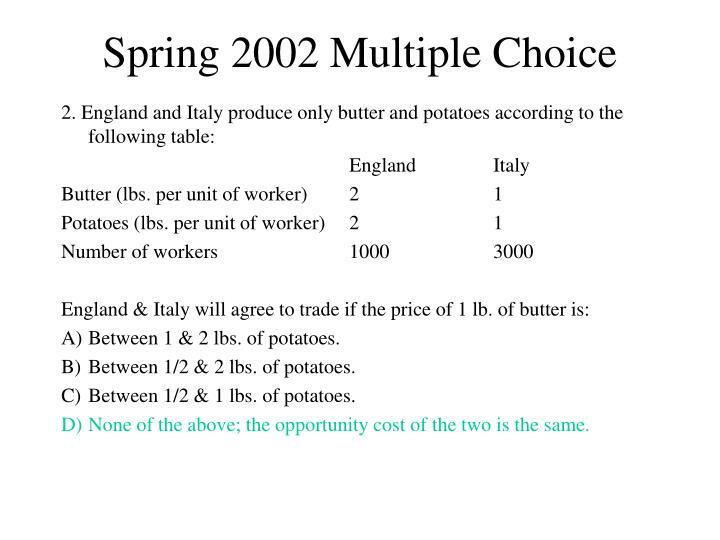 c.	Producers pay the whole tax, while consumers do not pay anything. 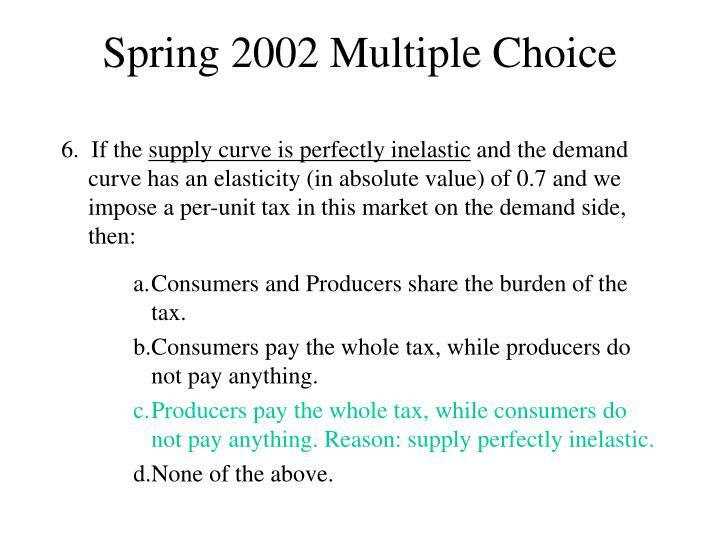 Reason: supply perfectly inelastic. where Qsis the supply of CDs, and Qd is the demand for CDs. 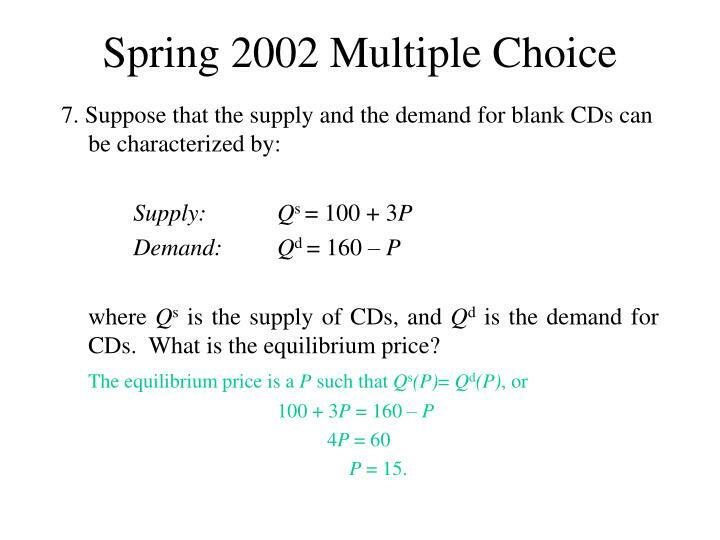 What is the equilibrium price? a. Less than 145 CDs. b. 145 CDs. c. More than 145 CDs. d. We do not have enough information to answer this. 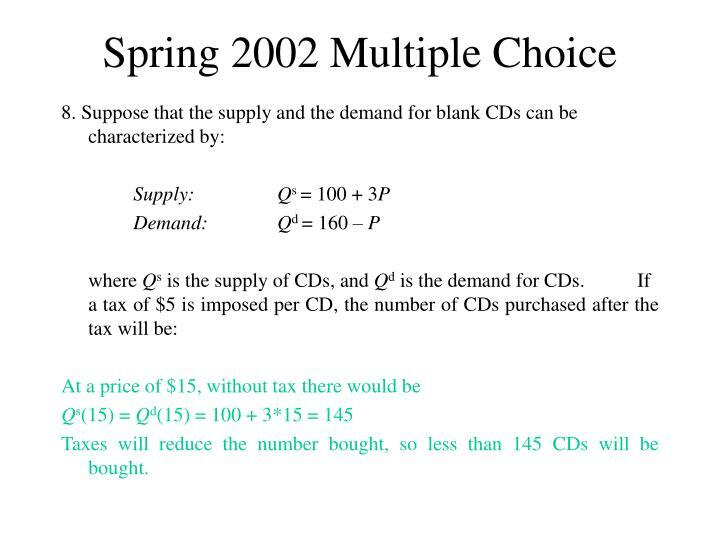 Taxes will reduce the number bought, so less than 145 CDs will be bought. 9. 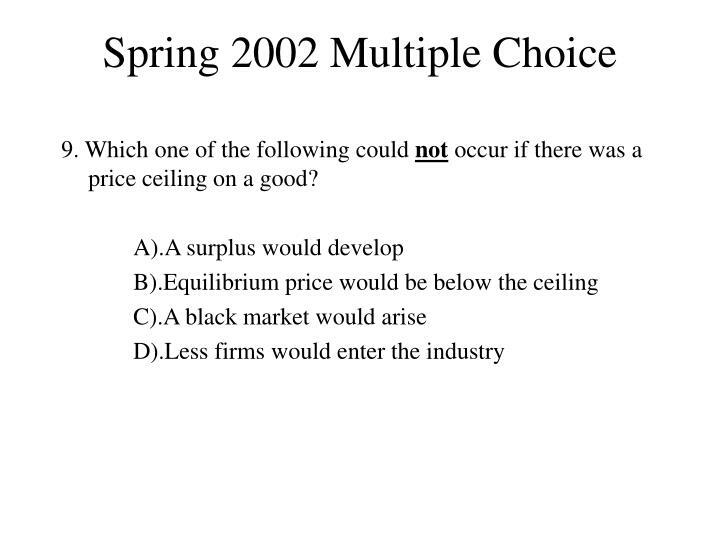 Which one of the following could not occur if there was a price ceiling on a good? 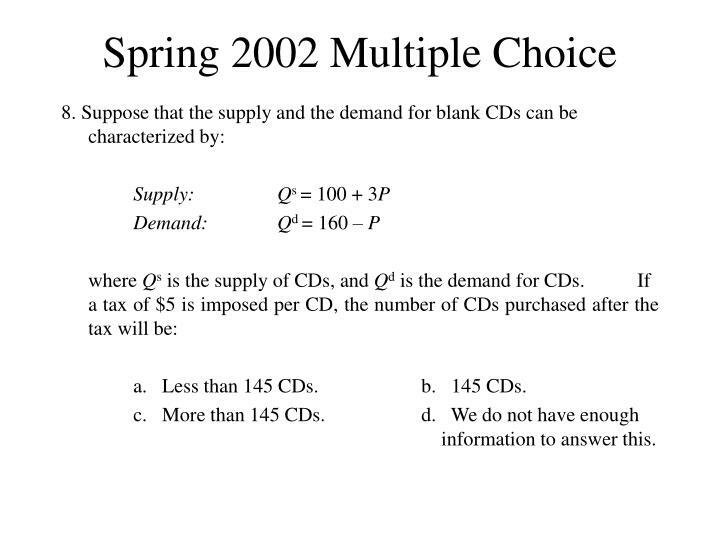 Reason: a surplus only occurs when the quantity supplied is greater than the quantity demanded. Normally, this would cause prices to drop, and a price ceiling won’t prevent this. A price floor would. a. The food at Eatwell has close substitutes and thus demand elasticity is greater than 1.
b. 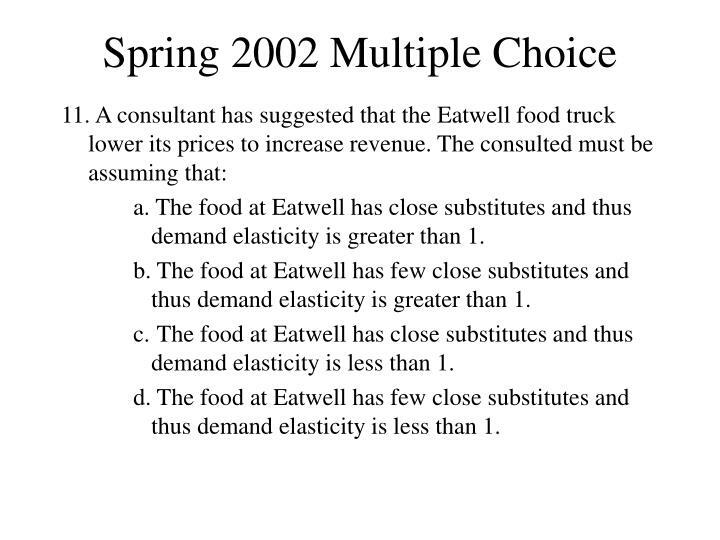 The food at Eatwell has few close substitutes and thus demand elasticity is greater than 1.
c.	The food at Eatwell has close substitutes and thus demand elasticity is less than 1.
d. The food at Eatwell has few close substitutes and thus demand elasticity is less than 1.
a. Everyone who can produce a good produces it. b. Everyone who wants a good buys it. c. Consumers who value the good the most buy it. d. Producers with the highest opportunity costs	produce it. a. 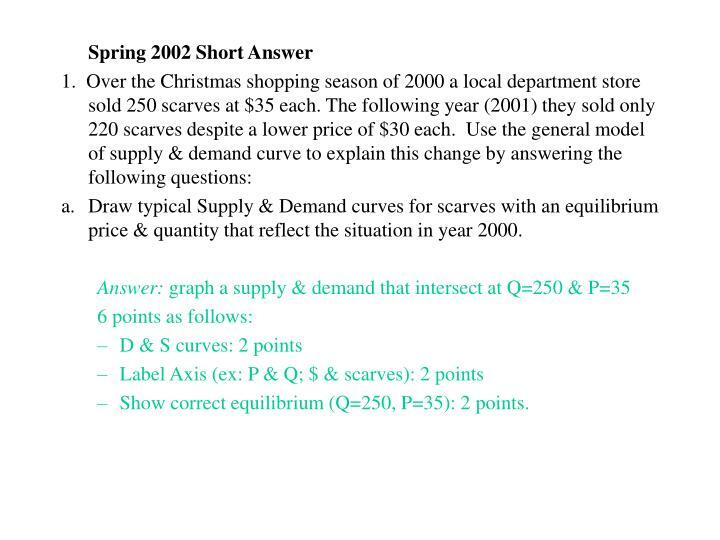 Draw typical Supply & Demand curves for scarves with an equilibrium price & quantity that reflect the situation in year 2000.
b. 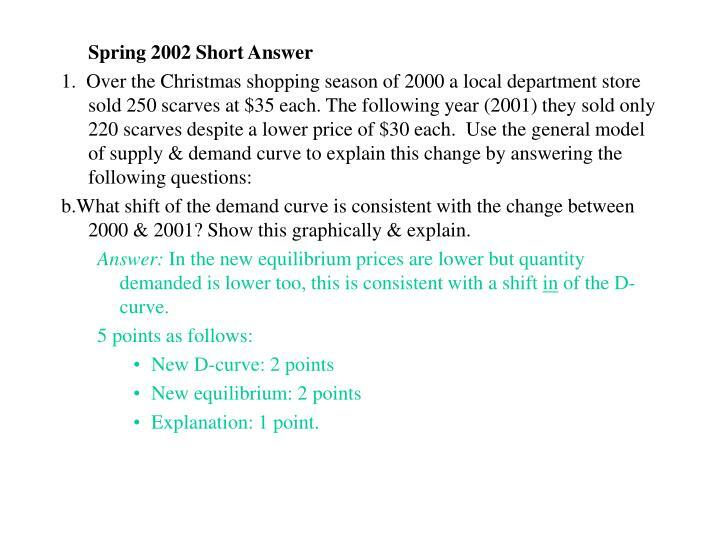 What shift of the demand curve is consistent with the change between 2000 & 2001? Show this graphically & explain. c.	Suppose that only thing that changed between 2000 & 2001 is that incomes declined. 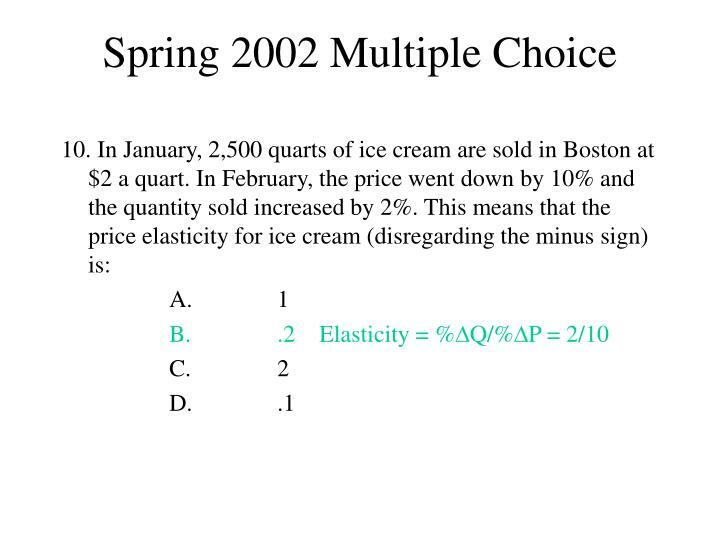 What does this imply about income elasticity? Is this a normal or an inferior good? d.	Now suppose incomes did not change between 2000 & 2001. What other reason may cause the shift in demand you described in part b? 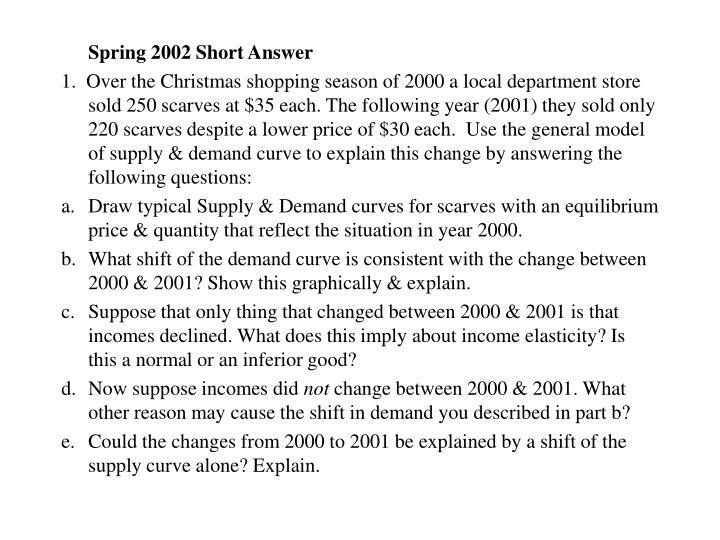 e.	Could the changes from 2000 to 2001 be explained by a shift of the supply curve alone? Explain. 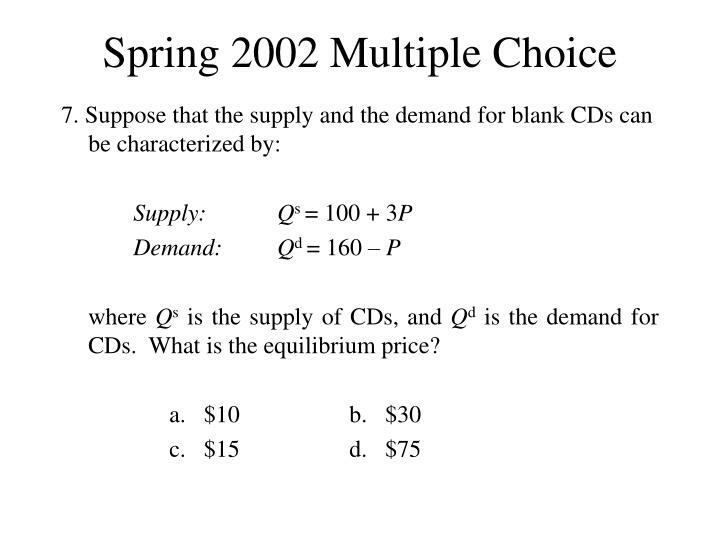 Show correct equilibrium (Q=250, P=35): 2 points. 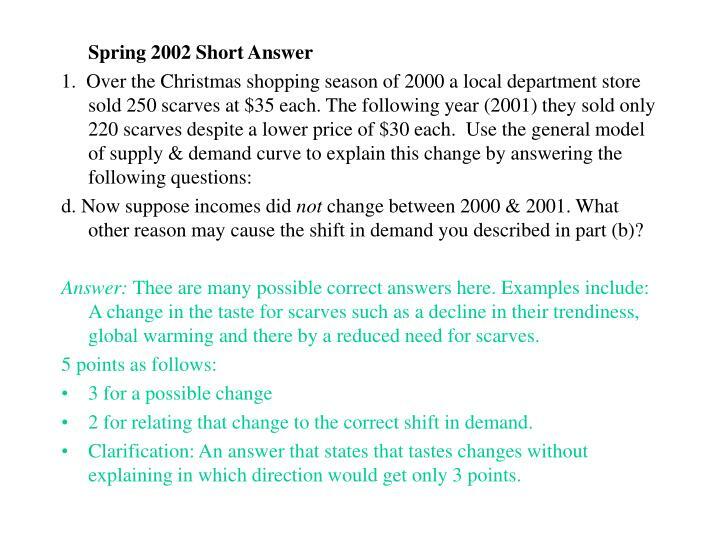 b.What shift of the demand curve is consistent with the change between 2000 & 2001? Show this graphically & explain. 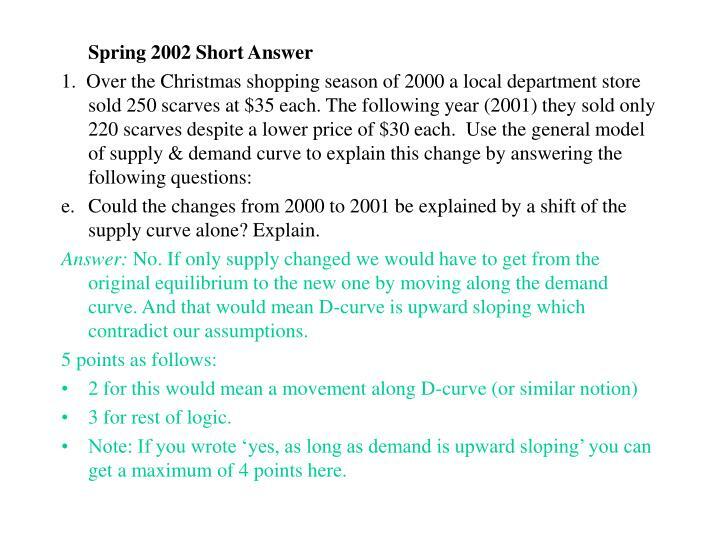 Answer: In the new equilibrium prices are lower but quantity demanded is lower too, this is consistent with a shift in of the D-curve. Answer: We see that as income declined demand shifted in. 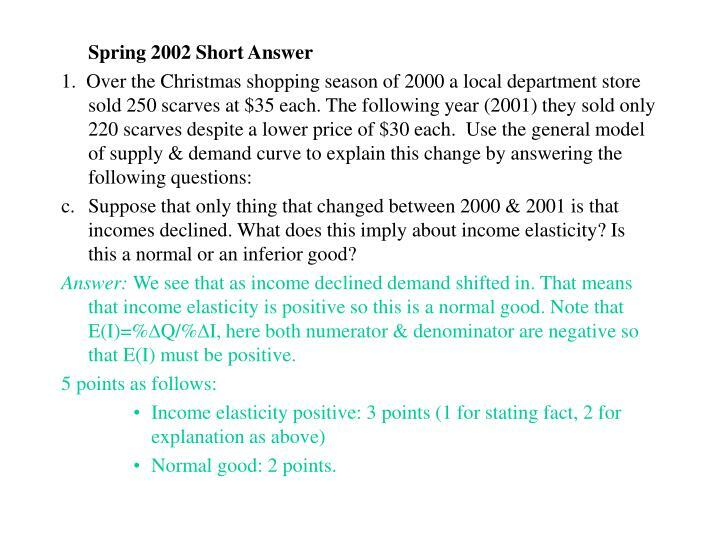 That means that income elasticity is positive so this is a normal good. Note that E(I)=%Q/%I, here both numerator & denominator are negative so that E(I) must be positive. d. Now suppose incomes did not change between 2000 & 2001. 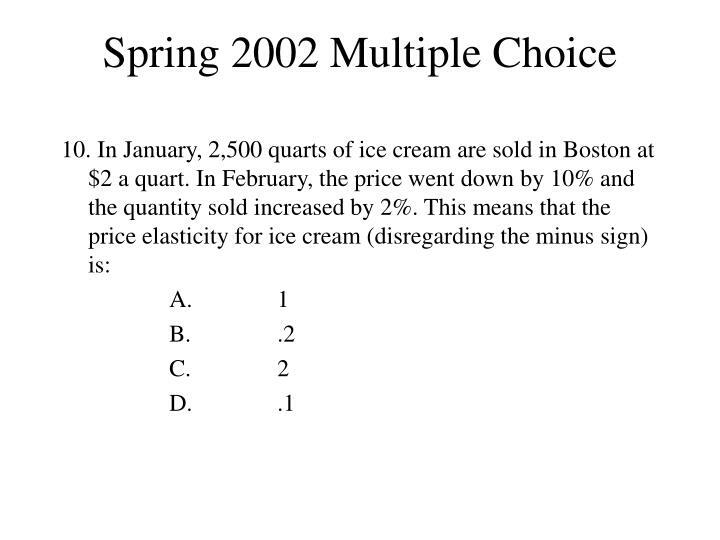 What other reason may cause the shift in demand you described in part (b)? Answer: Thee are many possible correct answers here. Examples include: A change in the taste for scarves such as a decline in their trendiness, global warming and there by a reduced need for scarves. 2 for relating that change to the correct shift in demand. Clarification: An answer that states that tastes changes without explaining in which direction would get only 3 points. Answer: No. If only supply changed we would have to get from the original equilibrium to the new one by moving along the demand curve. And that would mean D-curve is upward sloping which contradict our assumptions. 3 for rest of logic. Note: If you wrote ‘yes, as long as demand is upward sloping’ you can get a maximum of 4 points here. a. Draw Italy’s PPF. 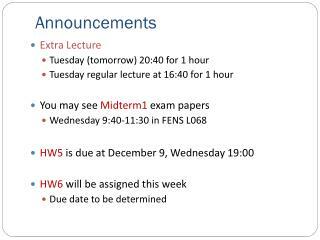 (Explain briefly). b. What is the opp. cost of increasing the prod of wine from 2 to 3 barrels? 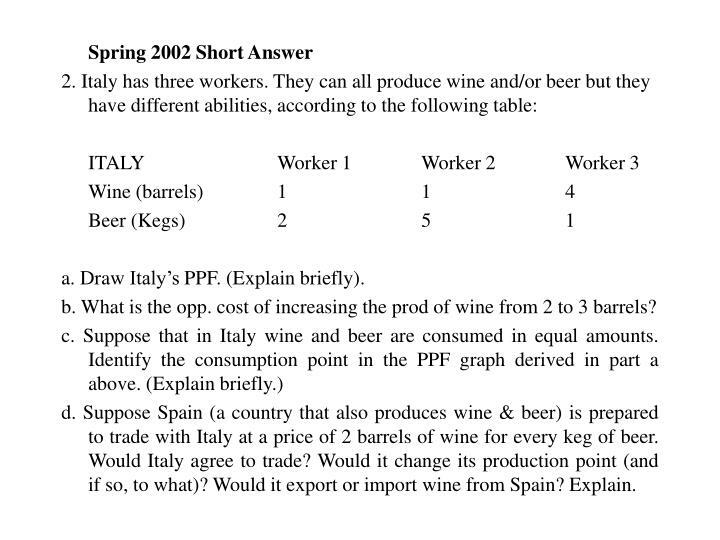 d. Suppose Spain (a country that also produces wine & beer) is prepared to trade with Italy at a price of 2 barrels of wine for every keg of beer. Would Italy agree to trade? Would it change its production point (and if so, to what)? Would it export or import wine from Spain? Explain. 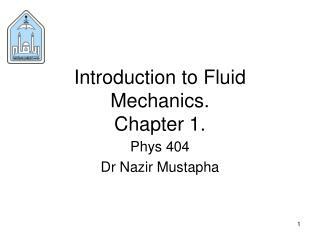 2 points for explanation/calculation etc. b. What is the opportunity cost of increasing the production of wine from 2 to 3 barrels? Answer: As you increase production of wine from 2 to 3 barrels you must shift an extra part of worker #3 from beer making to wine making. Specifically you must give up ¼ of his time making beer, so you give up ¼ barrels of beer. The O.C. of wine at that point is therefore ¼ kegs of beer. 4 for explanation (either algebraic, graphic or in words as above). 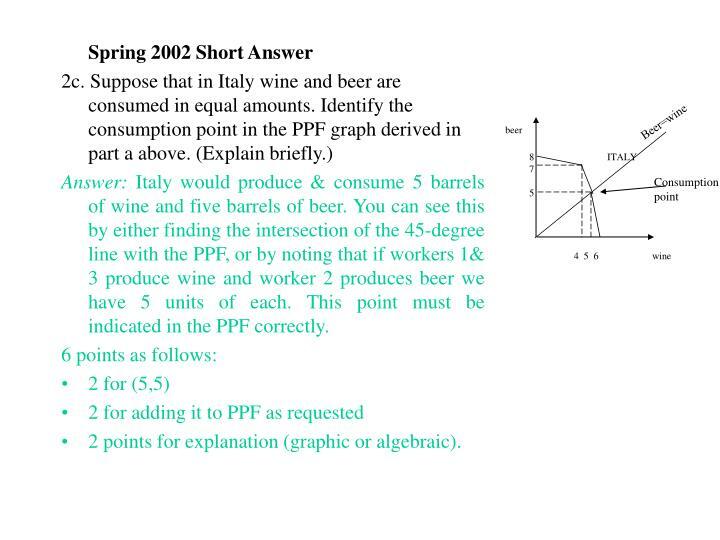 Answer: Italy would produce & consume 5 barrels of wine and five barrels of beer. 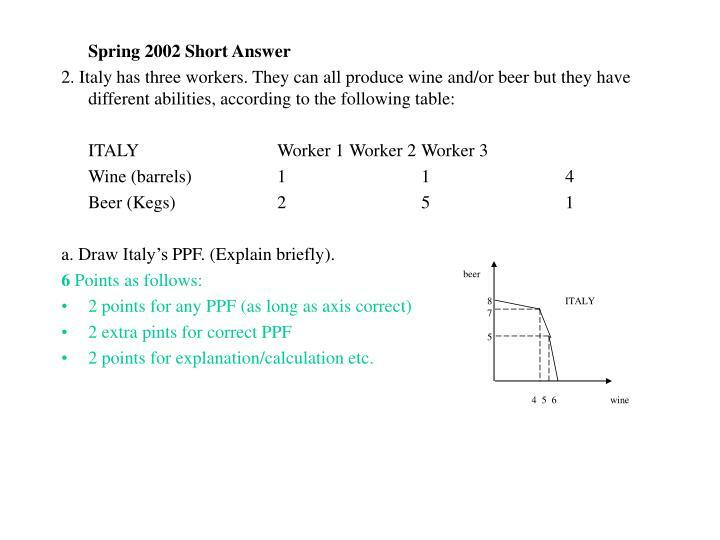 You can see this by either finding the intersection of the 45-degree line with the PPF, or by noting that if workers 1& 3 produce wine and worker 2 produces beer we have 5 units of each. This point must be indicated in the PPF correctly. 2 points for explanation (graphic or algebraic). Answer: Yes. Italy would be prepared to trade. 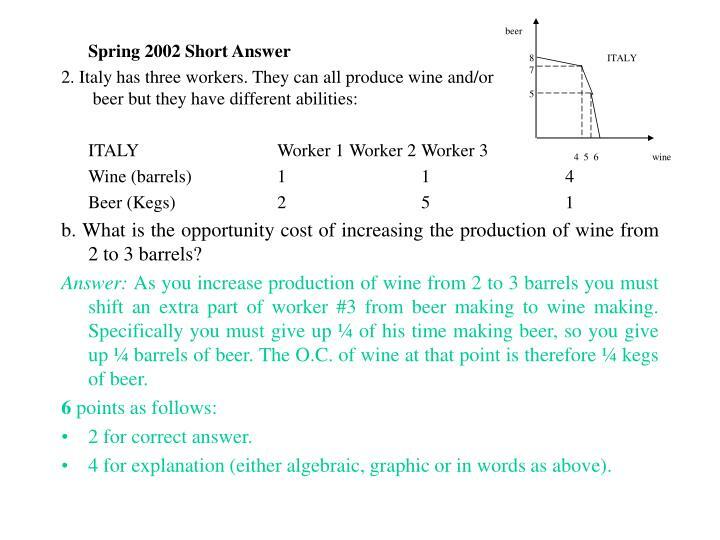 Italy would now produce wine with worker #3 as their O.C. of wine is greater that the price ratio of 2 wine to 1 beer (or 1 wine to ½ beer). Workers 1 & 2 would produce beer. Italy is now producing 4 units of wine & 7 units of beer. 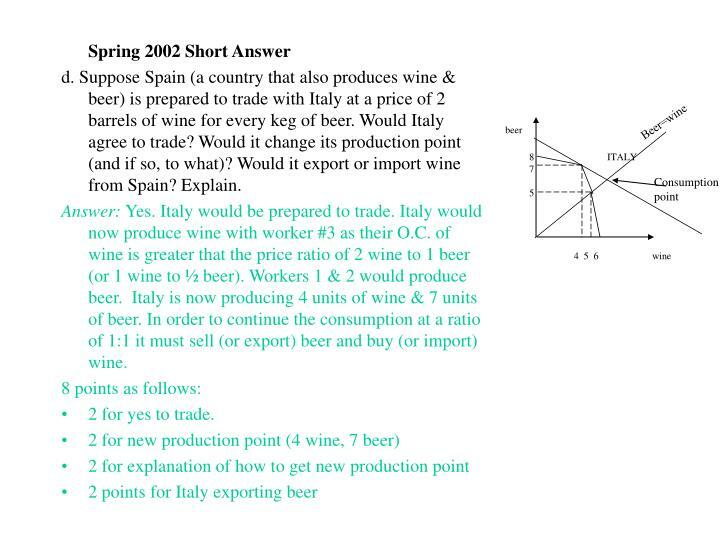 In order to continue the consumption at a ratio of 1:1 it must sell (or export) beer and buy (or import) wine. 2 for yes to trade.